PRESS RELEASE — The Parade of Homes, produced by Home Builders Association of Metro Denver (HBA), is bringing back the popular #MyParadeInspiration social contest. The contest will coincide with the 2018 Denver Parade of Homes. 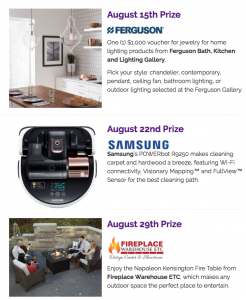 Ferguson Bath, Kitchen and Lighting Gallery, Samsung and Fireplace Warehouse ETC are each sponsoring one of the three weeks during which the contest will take place. The #MyParadeInspiration social contest will run from Thursday, Aug. 9, 2018 through Sunday, Aug 26, 2018. During this time, the Parade will be held on Thursdays, Fridays, Saturdays and Sundays from 11 a.m. – 6 p.m.
Tag Parade of Homes Denver, the weekly sponsor, and the Home Builder with #MyParadeInspiration. Each week during the Parade of Homes, one (1) lucky individual, who has entered the social contest, will win a prize valued at a minimum of $1,000. Winning entries will be announced on Wednesdays, starting August 15, 2018. Must be 18 years or older to enter. For contest rules and regulations, visit paradeofhomesdenver.com/contest. Showcased properties will be found throughout Metro Denver from Timnath to Castle Rock and Arvada to Aurora, and Winter Park. This free, self-guided tour is a wonderful opportunity for potential home buyers and anyone interested in home remodeling and design to get new ideas and inspiration.